When planning your home extension project in Surrey, you’ll have a lot to think about. First and foremost, you have to decide whether you want a glass extension, a conservatory or an orangery. What’s the difference between a glass extension and the other two options mentioned? An extension doesn’t have interconnecting doors, which means it needs to achieve a certain level of thermal efficiency. Even if a glass extension in Surrey isn’t suitable for your expansion plans, Castle Conservatories has the expertise to create the space that you need, while filling your new room with lots of light. In this short guide, we’ll talk about the different design options available, so that you can make an informed decision. Which of our products meet the criteria of your home improvement project? Here are a few options for you to consider. Although not technically a glass extension, the Classic Conservatory is made predominantly from glass. A glazed roof can be combined with full-height glazing to deliver a light-filled environment that feels spacious. Depending on whether you want to achieve a modern or traditional design, you can opt for a dwarf wall or super-insulated columns. It’s also possible to site the columns on top of the masonry to create a balanced design. Super-insulated columns improve thermal efficiency five times more than masonry piers of the same dimension. The columns will add a touch of style and authority to your glass extension and will be plastered internally. Achieve a glass extension look and feel with our Classic Conservatory, which can be built in almost all of the popular building styles. If you love the light, then you’ll want to take a more in-depth look at our lantern orangery. Although traditional orangeries have a high brick-to-glass ratio, we have the expertise to create modern and light filled environments for our customers. Our lanterns feature fewer bars, reducing barriers to light entry. If you choose a flat roof option, your orangery will feel even more like a glass extension. Multiple lanterns can be used, depending on the aims of your Surrey project. The roof system that we use allows for wider-spanning bi-fold doors or patio doors, too. The extensively glazed areas in your doors will flood your room with light while preventing your glass extension from overheating during summer. Enjoy better views and improve access into – and out of – your home in Surrey with our stunning lantern orangery. Contact us now to find out more. Will My Glass Extension Meet Building Regulation Requirements? Your glass extension will meet building regulation and planning permission requirements in full. Technically, your structure will be classified as a conservatory or orangery if it has interconnecting doors separating your new structure from your Surrey home. We can discuss removing doors as part of the project specification. Can I Customise My Glass Extension To Blend In With My Home? You will be able to customise your glass extension so that it complements the architectural style of your home in Surrey while blending in with your chosen themes and schemes. The Castle Conservatories team will help you choose the most appropriate enhancements, so as to meet your aesthetic and performance requirements in full. Can I Just Replace My Conservatory Roof? If you already have a glass extension with sturdy foundations and strong frames, it may be possible to replace the roof to bring the structure up to modern standards. 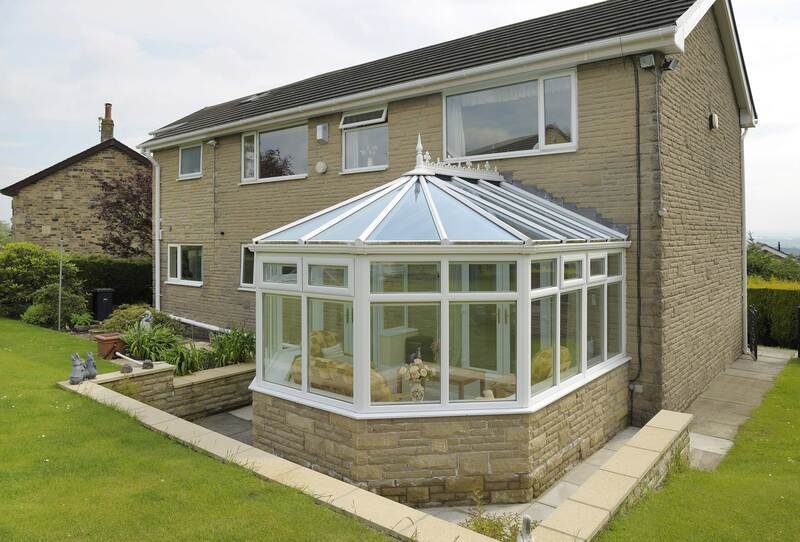 We offer three options: solid, tiled and glass conservatory roofs. Any of these three options are suitable for home extension projects. Ask for details when calling. How Quickly Can You Build My Glass Extension? The manufacturer that we’ve chosen to work with prefabricates its products at its dedicated factory first. This means that less work is required on site when we arrive at your home in Surrey, cutting down on installation time. We will give you a time estimate before commencing work – so that you can make an informed decision. To explore our range of products from the comfort of your home – or while on the move – visit our brand new Virtual Reality Tour tool. Enjoy a 360 degree view and click on features within each image to learn more. Contact the Castle Conservatories team directly to make an appointment, ask a question or request a quote. Call our team today on 020 8669 1500 or send a short message to info@castlecon.com to request a callback. Are you collecting quotes only at this early stage? Use our extension quoting tool to build your product online by answering a few simple questions. You will then be given a guideline quote for your home expansion project in Surrey.